Skyknight Legionnaire’s second printing is now basically old enough to be a meaningful Throwback Thursday – and its first is so ancient that it’s illustrated by Jim Murray, who we haven’t seen much of for quite a while! While the card may look very vanilla compared to similar cards with added extras (cf. Chandra’s Phoenix), it’s solid and reliable and gets the job done. Two immediate flying damage is good enough for decks based on small creatures to pressure opponents, and it becomes a lot more dangerous when you add Glorious Anthem effects and equipment to the table. Even if that doesn’t come up – Ixalan‘s dinosaurs offer a lot of tempting alternatives at the same cost – Skyknight Legionnaire will always have an interesting distinction: I believe it’s the only card other than the shocklands that has been in all three Ravnica blocks. Back for the third time in Standard, and its third printing as a Boros card in a Ravnica set. Some things never change. 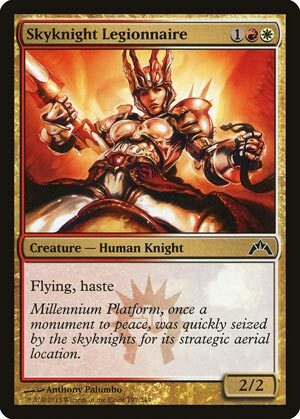 Skyknight Legionnaire is a solid part to the Boros gameplan of swooping early, often, and even with impunity. 3 mana for a 2/2 flier is a fair rate of return, but a flier with haste is much better! And it goes without saying that the Legionnaire can rack up a lot of damage early…and late now, thanks to mentor giving it a bit more reach late. It’s been a staple of Boros in two previous blocks, and the third go is no different. Skyknight Legionnaire should see a healthy amount of play in Standard, and it’s excellent in Limited. Play it early and often.